ELEGANT 3/2 SANIBEL PREMIER HOME - VILLAGE OF FERNANDINA at MACCLENNY. POOL HOME/w a 3 CAR GARAGE, OFFSET premium lot. 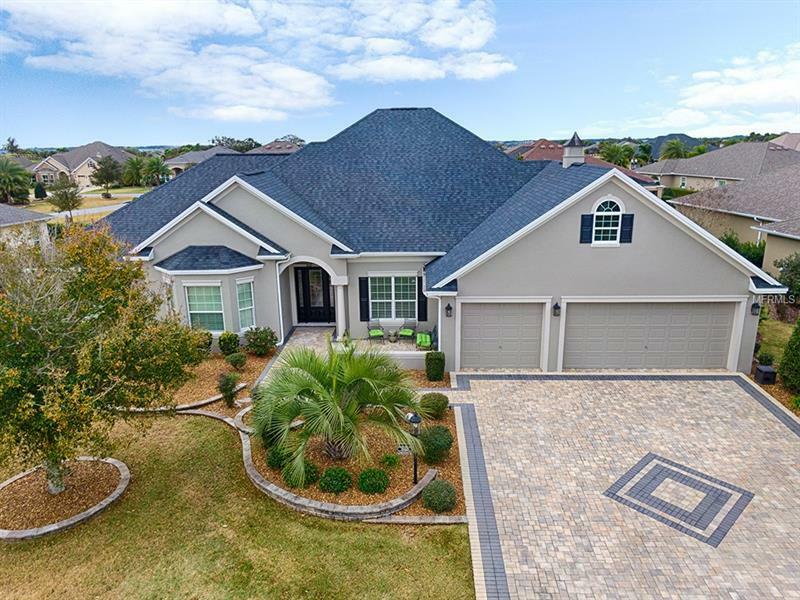 DESIGNED PAVER DRIVEWAY & WALKWAY, LEADED UHV GLASS front door w/sidelight, DIAGONAL TILE flooring that flows throughout foyer, living/dining rooms, kitchen, laundry, baths w/ carpet in the bedrooms. CROWN MOLDING, CUSTOM LIGHT FIXTURES, and Custom CORNICE enhance the home. SPACIOUS KITCHEN includes an ISLAND, premier tiered glazed maple cabinets with molding, a BUILT-IN DOUBLE OVEN with the upper being a CONVECTION OVEN, SMOOTH TOP GLASS COOKTOP, FRENCH DOOR REFRIGERATOR, GRANITE COUNTER TOPS, GLASS BACKSPLASH, under cabinet LIGHTING, an ABUNDANCE of storage including a DOUBLE PANTRY AND PULL OUTS, DUAL CLIMATE control system, Bullnose Corners, Arched Entryways, TRAY CEILING the living room is ENHANCED/w CROWN MOLDING & LIGHTING, and the DEN has a BAY WINDOW/w a storage bench. Master bedroom w/ EXTRA WINDOWS, french doors to the lanai, tray ceiling, walk-in closets, en-suite bathroom w/WALK-IN shower, GARDEN tub, dual sinks & separate toilet room. Living room opens w/STACKBACK doors, EXPANDED SCREENED lanai/w PAVER FLOORING, a 15 x30 POOL, WATERFALL & SCONCES, a SUMMER KITCHEN w/ GRILL, in-ground 60-gallons tank, REFRIGERATOR, SINK, 2 RETRACTABLE AWNINGS that can separate the large patio into smaller, outside access to add a pool bath. Lush landscaping providing TOTAL PRIVACY. Garage w/windows pull downstairs, extended totaling 1062 sq. ft. of garage space. Exterior painted in 2018.